# of Pages: 428 p.
Thom Creed is a teenager coming to terms with many issues in his life including the disappearance of his mother when he was young, the fall of his heroic father, and his questionable sexuality. His father was once a huge hero, but due to an unfortunate event he lost his hand and became a complete outcast. Now, there is a league of heroes who all have superpowers. During a basketball game, Thom begins to see the beginnings of a superpower he might possess. As he struggles to learn more about his power he also struggles with the feelings that he thinks he might be homosexual. Both of these developments would anger his father greatly. After getting kicked off his basketball team for the rumor of his homosexuality, Thom decides to go to hero tryouts in order to be a trainee for the league. He meets many aspiring heroes with powers that have not yet become completely controlled. After making a probationary team, Thom learns how truly difficult it is to be a hero and feels bad about the disappointment his father has become simply for trying to help people. As Thom works with the league he comes to find out more about why his mother left, what really happened when his father lost that hand, and where he truly belongs. 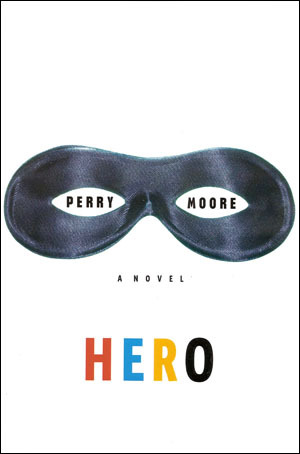 This story about heroes training to save the world brings fun adventures along with deep feelings about many very real issues teenagers face today including sexuality, friendship, parents, reputations, and finding what one is supposed to do in this world. The issue of homosexuality is an issue that many young adult authors do not touch, which makes this story unique. Thom’s feelings hinder his aspiratons to become a hero, which connects nicely to aspirations many young people have but feel prejudice will keep them from doing it. For example, even in our evolved society a homosexual teen would have a harder time breaking into pro sports than a heterosexual one. While some readers may feel his homosexual fantasies are too graphic, they are no worse than any other sexual fantasies present in similar material. Moore does a nice job of taking realistic elements and mixing them into the fantasy world where superheroes exist.